Politics / News Can North Lawndale win the Obama Presidential Library when the other team won't play by the rules? 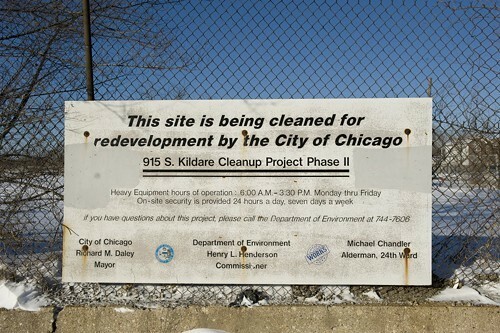 This vacant lot in North Lawndale could become the site of the Obama Presidential Library. I think the best way to illuminate the latest twists and turns in the Obama Presidential Library fiasco is with an analogy to my beloved game of basketball. Imagine, if you will, a ragtag team of kids from an underfunded public school on the west side traveling south to Hyde Park to do battle with the mighty Maroons of the University of Chicago Lab School. Generally, they have a pretty good team—for a private school. And, let's say, our dogged bunch of scrappy west-side overachievers ekes out an improbable victory on the unfriendly confines of the Maroons' home court. But as they're heading home in triumph they hear that the powers that be—like Mayor Rahm—have put more time on the clock. So while they're on that bus for the west side, the Maroons are back on the court scoring uncontested layups. As everyone bends over backward to make sure the home team wins. That, my friends, is sort of what's going on as the University of Illinois at Chicago (backed by residents from North Lawndale) takes on the University of Chicago (backed by the mayor) for the rights to win the presidential library. When President and Michelle Obama announced they were going to build a presidential library, they made it clear that each applicant would have to follow a precise set of rules that are clearly spelled out in the request for proposal. Among those rules is the one dealing with the proposed library site. That is, the applicant either has to own the land outright or have a firm commitment that they will own the land if they want the Obamas to give them the library. Or, as the RFP puts it, the applicants must provide a "detailed proposed process to obtain control of the site and convey it to the [Obama] Foundation." This is no small thing, as the UIC and North Lawndale applicants came to learn. They wanted to build the library on a 23-acre, city-owned vacant lot at roughly Roosevelt and Kostner, once home to an illegal dump. So before they submitted their RFP, they needed a guarantee from his eminence, the mayor, that he would, in fact, turn over the land. If by chance the Obamas choose the UIC/North Lawndale bid. This guarantee did not come easy; west-siders had to basically twist the mayor's arm before he agreed to finally sign a letter agreeing to have the city turn over the land if the Obamas chose the west side. I know that couldn't have been easy for you, Mr. Mayor. So thank you. Similarly, the University of Chicago does not own the land on which they're proposing to build the library. The Park District does. But, unlike UIC, the University of Chicago has no guarantee that the park district will allow them to build the library in either Jackson or Washington park. In short, the University of Chicago submitted their proposal without the necessary guarantee that the Obama foundation required. If this were a game of basketball, it'd be over. And North Lawndale would be moving on to the next round to play against those dastardly Lions of Columbia University, speaking of the pampered and well connected. But obviously, the Obama Foundation and Mayor Emanuel want the University of Chicago to remain in the game. So they're putting more time on the clock, so to speak, allowing the university to officially petition the park district to turn the land over to the city so that it can be turned over to the Obama Foundation. I know I'm not alone when I suspect that the real reason the mayor and the University of Chicago didn't immediately go public with their plans to put the library in Jackson or Washington parks is that they knew it would spark an outcry from park users. And that outcry might jeopardize the university's proposal. Apparently, they were going to wait until the foundation had approved their proposal before they went public with the location. Either that or they're so arrogant, they don't give a damn one way or another about the public. Well, that is sort of the university's tradition. In any event, the Obama Foundation called them out. As one source told the Tribune: the foundation's board is "very hesitant to commit to a site that isn't controlled by the university making the proposal. They wouldn't want to commit to a site and then find out [the library] can't be built on their timeline." I suppose that the Park District board will ultimately give the university the OK it needs to build on the land. I mean, that board is such a rubber stamp that if Mayor Emanuel told its members to jump into the lake, their only question would be—which lake, Michigan or the great one they call Gitche Gumee? In any event, round one of the U. of C.'s hurry-up offense starts tonight with a dog-and-pony public hearing on whether it's a good idea to plow over parkland in Jackson or Washington parks. As opposed to just putting the library in North Lawndale, where it would do the most economic development good. The first meeting is at 6 PM at Hyde Park Academy High School, 6220 S. Stony Island. There's another hearing at noon on Wednesday in the Washington Park Field House.